Are you in need of a unique red-gold Holy Table vestment? Your search stops here – we offer a sizeable collection of these important Orthodox Christian church items and deliver them with the guarantee of traditional style, high quality workmanship and reasonable pricing. 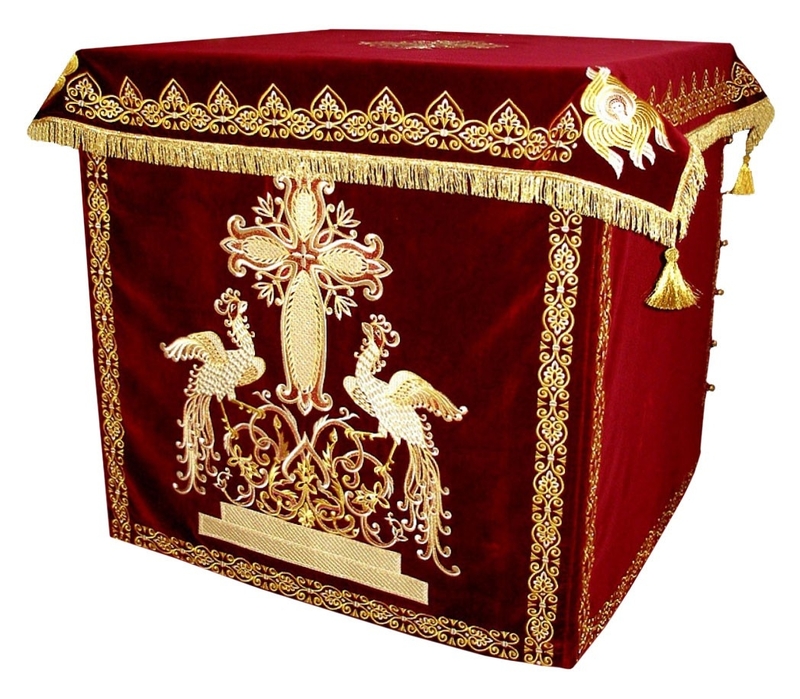 The Holy Altar is the most sacred space in an Orthodox Church and a red-gold Holy Table vestment enhances this sacredness during particular liturgical services. We offer red and gold Holy Table vestments in opulent fabrics such as man-made silk, brocade and natural German velvet. In case customers want a particular vestment in a different fabric belonging to the same class, they may indicate their preferred alternative in the Notes field of their order after reviewing available options in the ‘Fabrics’ section our website. 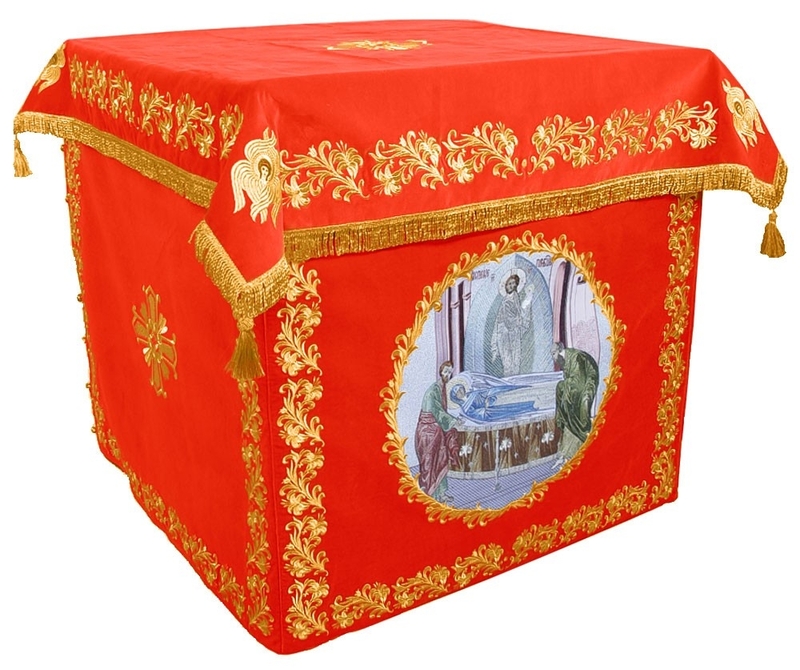 Red-gold Holy Table vestments made from natural German velvet feature beautifully detailed hand-embroidered images related to the Orthodox Christian faith. Holy Table vestments are different from Holy Table covers since they completely cover the table from top to bottom and are used during liturgical services. We provide decoration for these vestments in the form of galloon and customers who are interested in better quality adornments can opt for premium decoration that’s available for an additional cost. We strive to help customers purchase the Holy Table vestment they want at a price that’s affordable to them. Another benefit of shopping with us is that customers can opt for our made-to-order services. Our dedicated tailors have a wealth of experience behind them which allows them to execute each order with best quality workmanship and attention to detail. Please allow us a few weeks to fulfill an order. Customers who require a vestment early can opt for our rush order services. We offer a wide array of convenient, secure online payment methods including payment by credit card and PayPal. Take your pick and place your order from wherever you are in the world!